When Biltwell introduced our super-comfortable open-face novelty helmets seven years ago, we helped resurrect a style that was synonymous with chopper builders and bikeriders of the '60s and '70s. After reenergizing the game with a virtual Skittle sack of solid and Megaflake colors, Biltwell next attacked the status quo with a line of DOT-approved open-face helmets in a whole new range of tough-looking flat paint finishes. In a few short years, Biltwell open-face helmets became as common as denim and leather at motorcycle hoedowns from tBaja to the Big Apple. 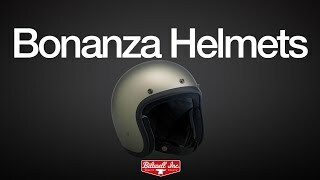 Today Biltwell is changing the game again with the brand-new Bonanza helmet. This leaner, lighter and even more comfortable DOT-approved 3/4 lid boasts the same hand-painted finishes as the other lids on an even lower-profile molded ABS shell. The Bonanza's interior boasts a custom-shaped EPS safety shell and a hand-stitched liner with moisture wicking brushed Lycra panels and open-cell foam padding for breathability and comfort. The rugged nylon neck strap features plated steel D-rings and a snap strap end retainer with Biltwell anvil branding. Got the helmet just two days before a 1400 mike trip In Michigan’s beautiful upper peninsula. Worked great and very comfortable the whole way. Got lots of compliments on color and look. Not for the Fat of head. I got this helmet as my first new helmet. I'd say it's perfect for the beginner. Very durable, light weight, economical, it was a great option to not have someone else's greasy hair in my helmet... but as you can imagine from my title it didn't work out so great for me personally. I require an xl or xxl I'm most helmet sizes. This style, on my oversized bean, created a spaceballs look. I became obsessed with how absurd I looked, looking in every tail window I came up behind. 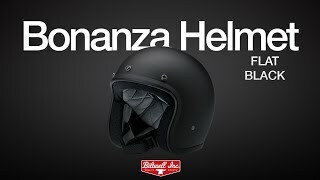 So in short, great beginner helmet for a very reasonable price. If your head is fat, go for a full face helmet to cover your shame. The slight egg shape is unavoidable in a DOT helmet, but that's part of what you give up for safety. Otherwise this has got to be one of the best helmets I've owned. I've always had modular helmets before but got tired of how heavy and just plain big they are, this helmet with the bubble shield fantastic!!! I recommend them to everyone and have already begun thinking about the color of the next one i'll order is. for the price you may as well have a few! This helmet fit well to my size selection and is super comfortable! Probably the best riding helmet I have and a good price! I put the torc Bubble Shield on it and it works great! Very well made and comfortable, finish is flawless. The bad- it looks big on me but, that is the way DOT helmets fit.